Well, probably the majority of us, in all honesty, are retired grey haired old men. This isn’t compulsory though and we do have two lady volunteers and several younger members who are still in employment. We number around 50 people and were recruited by HMC curator Stephen Laing and volunteer co-ordinator Sonja Dosanjh in July 2012 with the new Museum Collections Centre very much in mind. One thing we all have in common is we love cars and messing about with them. A large number of us have worked in the motor industry, or related trades and professions. Amongst our number are an RAC man, a gas turbine engineer, a Rootes Group technician, a rally competition manager, a Rover Group research engineer, an RAF engine technician, a Ferrari/Jaguar restorer, a physicist, an expert on steam engines and an ex-MP. 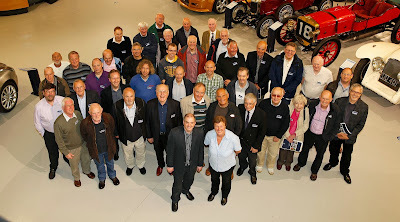 Furthermore, probably almost half of the volunteers have classic or vintage cars of their own which they’ve restored. Our own mini classic car show is therefore being planned for next summer. Future blogs will give details and photos of the restoration projects we have so far undertaken as well as an insight into some of the other activities we’ve been involved with.